The success story of the Ars Nova Vocal Ensemble began in Kecskemét, Hungary in 1990. In the very same year it won first prize at the Athen’sInternational Choir Competition. Since 1996 the group has won first prize in its category at all of the international competitions it has entered, won Grand Prix ( Ankara/ Turkey, Tours/France, Zwickau/Germany, Budapest/Hungary two times, Maribor/ Slovenia, Verona/ Italy) seven times and won World Choir Championship (Graz/Austria, Riga/Latvia ) two times. Having earned international acclaim, the ensemble has received concert tour invitation several times to Greece, Austria, Turkey, Germany, Spain, Italy, France, Slovakia, Croatia, Great-Britain, Portugal, Switzerland, Holland, Macao, China, in the USA. 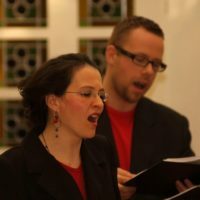 Subsequently, the group developed its own sonority, virtuoso vocal technique and built a repertoire in which contemporary Hungarian choral music features prominently. The ensemble and its leader, Dr. Katalin Kiss won the Artisjus Prize of the Hungarian Copyright Association on three occasions for its activity in premiering of contemporary Hungarian works and its pioneering work in that field. Recently ( October, 2015 ) the ensemble received the most prestigious Kodály Prize as an acknowledgement of their high standards of performance and successful artistic activity over the past 25 years. The group premiered a great number of choral works which have become part of the choral canon in Hungary and abroad. Several Hungarian composers have dedicated works to the group and their leader.